This past year I made the principles of civic virtue and doing things for the common good priorities in my classes. We explored these principles first in the creation of our government and our economy, then continued to look at how the presences of these principles help ensure the wellbeing of our classroom, school, community, state, government, and society. Have you noticed that students tend to be more engaged when using iCivics resources? If so, why do you think that is? My students tend to be more engaged with iCivics' resources because they are direct and to the point, while still being engaging. This is for both the games and the text resources. I think they also really enjoy engaging with history and the economy through games and simulations. Especially since the iCivics games like, Do I Have a Right?, present authentic situations that they can easily relate to. I have used iCivics to improve civic discussion by using it as a building block. I use the iCivics lessons or resource library to give my students, many who are immigrants, background knowledge about American government, civics, and history. From there, depending on the topic, I build up using other resources such as articles from Newsela, or primary sources such as paintings or letters from the National Archives or Library of Congress, or news and video clips. Thanks to the unbiased background information my students feel more comfortable discussing some of the more intense topics we have been seeing in American history and in our modern society. 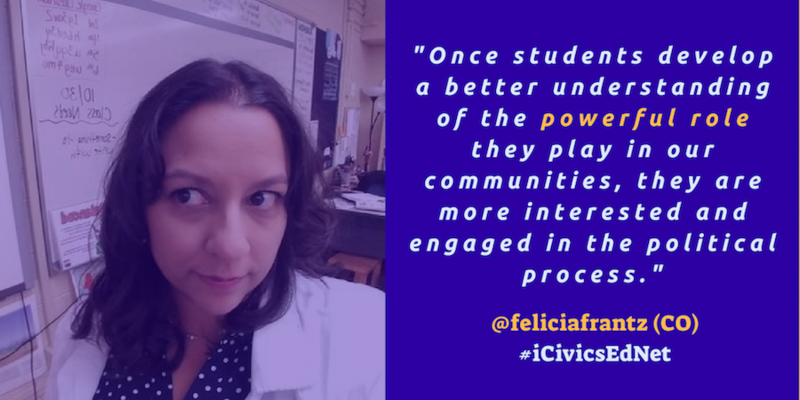 I think educators can use civics education to reverse students' disillusionment with the political process by giving them the skills, the background knowledge, and the opportunities to create small change at their local level. I think once students see and experience how the system applies to them and develop a better understanding of the powerful role that they play in our communities and societies, they are more interested and engaged in the political process. They start to care more because they begin to understand that they have a voice. Do you believe civic education is the key to developing future leaders? Oh my gosh! Do I ever! I believe that civic education can teach skills that are essential in any good leader. As I mentioned previously, I have made the principles of civic virtue and doing things for the common good building blocks for our classroom community. I think these are principles a leader needs to have and truly understand. They need to be willing to put aside their own needs and focus on needs for the population they represent. I also think other democratic principles like rule of law are necessary to help keep a leader balanced and level-headed in their interactions with others. Finally, by understanding the foundations of our government, leaders can learn what conflict, compromise, and resolution look like and provide guidance in how to listen to opposing opinions, respectfully agree or disagree, and how to argue one's point. All of which are skills that seem to woefully be lacking in our global society today. Follow #iCivicsEdNet on social media to see our members in action!